The last post to this blog attempted to explain that February 2017 dairy producer prices were up only because dry whey prices were up. Comments regarding the most recent post indicated some confusion. Cheese was down in price, butter was down in price, and nonfat dry milk was down in price. Yet, the Class III price was up. Internationally, producer milk prices were generally down. How is this possible? The Class III milk price is very important to most all U.S. dairy producers. It is not just important to those paid on components, but to all Federal Orders. California's current system is similar and California may soon become a Federal Order paid on components bringing it in line with the rest of the U.S. The explanation below is based on Federal Milk Marketing Order formulas. A producer, paid via the component system, receives a check based on his deliveries and priced at the current Class III price. He is later paid a Producer Price Differential for the difference between the Class III price and the Uniform milk price. An adjustment for the costs of running the Order are deducted from the Producer Price Differential. The producer will also receive adjustments for the transportation involved in delivering the milk to its intended location. However, the Class III price is the main determinant of the price the producer will receive for his milk. How is the Class III milk price is calculated? The formula below was obtained by using all the formulas for components, and then simplifying the equation to its simplest form. The minus "$3.20/cwt." at the end of the formula represents the accumulated make allowances and yield factors. In each case in the formula below, the commodity prices for cheese, butter, and dry whey are based on the NASS price/lb. The Class III price is expressed in price/cwt. The most important variable in the formula above is the cheese price. It is the value of cheese (typically between $1/lb. and $2.40/lb.) multiplied by 9.6. 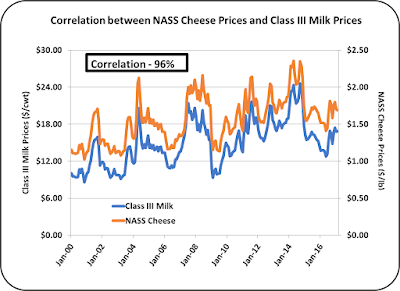 The first chart below shows a correlation of 96% between the cheese price and the Class III price. 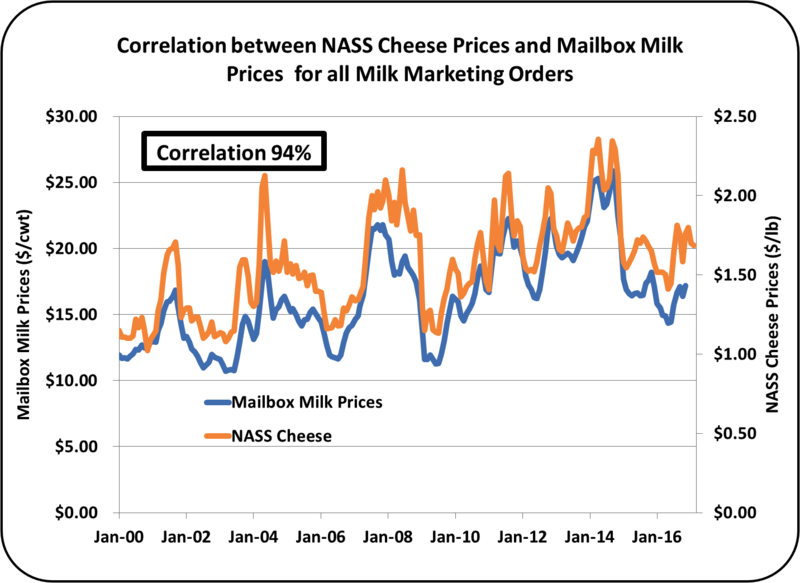 The second chart shows a correlation of 94% between the cheese price and the mailbox price. 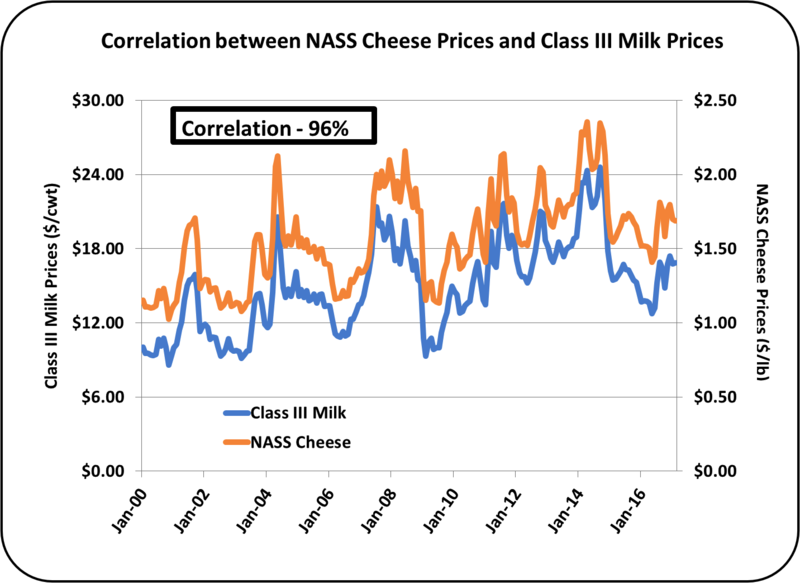 The correlations of 96% and 94% in the charts above establish a tight linkage between cheese price and producer milk prices. In the case of Class III, it means that 96% of the value and variability of the Class III milk price is related to the cheese price. When cheese is worth $1/lb., it contributes $9.60/cwt. to the Class III price, and when cheese is worth $2.40/lb. it contributes $23.04/cwt. to the Class III price. This is by far the most significant factor in producer milk pricing. The value of dry whey varies from $.25/lb. to $.45/lb. Dry whey has a much lower price when compared to cheese. However it does influence the Class III price because its price is multiplied by a factor of 5.9. That influence was covered in the prior post as dry whey prices have recently increased significantly. Because dry whey is an export item, its price is significantly influenced by international prices. When dry whey is worth $.25/lb., it contributes $1.48/cwt. to the Class III price, and when it is worth $.45/lb., it contributes $2.66/lb. 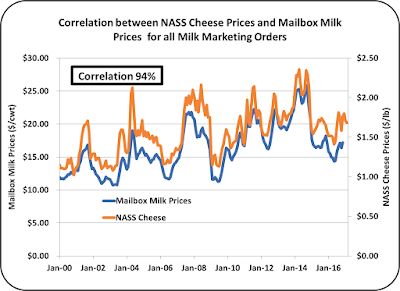 The impact of dry whey pricing on the Class III price is much less than the impact of cheese pricing. However, it is the second most influential parameter in the Class III milk price. Butter is the least influential commodity in the Class III price. Changes in the price of butter mostly switch value between milk protein and butterfat. (See the August 8, 2010 post for more detail on this.) Butter has traded in a range of $1.50/lb. to $2.80/lb., but with a multiple of just .4, its influence in the Class III price in minimal. When butter is worth $1.50/lb., it contributes $.60/cwt. to the Class III price and when butter is worth $2.80/lb., it contributes $1.12/cwt. to the Class III price. The butter price has the least influence on the Class III milk price. In the four orders that pay a premium for a lower somatic cell count, the price incentive is based on the cheese price. Truly, producer milk prices are primarily related to cheese prices. Four of the smaller Federal Orders are paid on the advanced system. These Orders produce primarily Class I milk. While their pay is based on cwt. of skimmed milk and butterfat, their formulas are very similar to the formulas for those paid on the component system. The price for Class I milk in the advanced system is based on the Class III (or IV) skimmed milk price. A Class I differential is added later, but the Class I price is typically based on the Class III price for all Federal Orders. When is the Class I price not based on the Class III price? The formulas used for Class I are based on the Class III or IV price, whichever is higher. 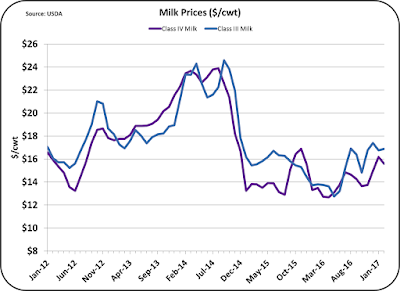 Below is a chart of the Class III and Class IV milk prices for the last five years. 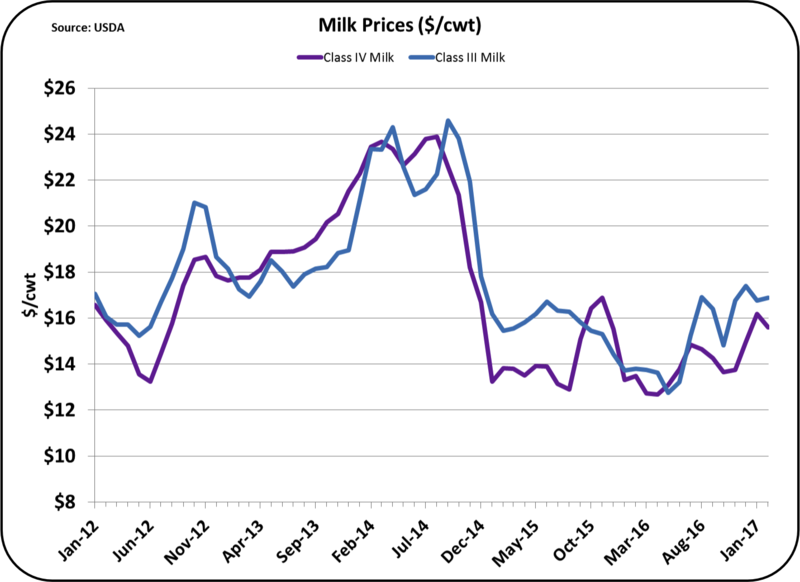 Since early 2016, the Class III milk price has been well above the Class IV price. The Class IV price is based on the value of NDM. NDM is largely an export product and international prices for NDM have recently been low. The Class III price has not been exceptionally high in 2016, but it has been well above the Class IV price. Therefore the Class IV price has not come into play in pricing Class I milk in over a year. There are times when the Class IV has been above the Class III milk price. See the July 16, 2014 post to this blog for a review of the influence of a high Class IV price. When the Class IV price is above the Class III price, Classes I, II, and IV are all based on the value of nonfat dry milk. This phenomenon, although infrequent, can certainly change the basis of the entire U.S. payment system. Globally there are many different payment systems for producer milk. The U.S. payment system is unique. Therefore, when the NASS price for dry whey influences the producer milk price, milk prices in other countries may fluctuate very differently. Analytics on exports and imports are now available and will be covered in the next post to this blog.